The PowerPUC is a system that allows 12 volts from your vehicle’s electrical system to be transferred to your wheels. The PowerPUC was developed and patented by RAW Design starting in 2007. The current G5 version is the most durable and easiest to install to date. It works whether the vehicle is in motion or parked. The ALL-NEW G5 Kits include our new EZ-Wiring Backbone System and EZ-Ring Mount. At the heart of the PowerPUC is a “Slip-Ring”. The technology is over 100 years old and is used in everything from electric motors to helicopters to the steering wheel in your car. It is surprisingly simple, extremely reliable and safe. The PowerPUC has been uniquely designed to fit and function in this application. Think of a record player (Remember those?) As the record spins, the needle is in constant contact with the record and transfers audio signals. The PUC works very similar. In our case, LEDs are attached to your wheel and connected to the “record”, which we call the PUC Ring. The PUC Ring mounts to your wheel. So the wheel, LEDs and PUC all spin together. Our “needle” is called the Power Block. The Power Block is mounted stationary to your bike and contacts the PUC Ring at all times. The Power Block is connected to your battery through a switch or remote controller. Electrical power can now flow to the LEDs through the PowerPUC. Does it use much power and will it kill my battery? LEDs consume very little power. As long as you have a healthy battery, it will have little effect if the lights are left on for a few hours without the bike running. The PowerPUC fits 99% of bikes on the road today. Most of those will use our new EZ-Mount System for the PUC ring. A very few will require “old school” alignment of the PUC Ring on your wheel. Reference our PUC SIZING TEMPLATE if you do not see your bike in our Kit Finder menus. Will it affect my wheel balance? With thousands of installations, we have never seen or heard of a wheel needing to be rebalanced after installation of a PowerPUC System. The fact that the LEDs are very lightweight and evenly spaced around the wheel contributes to this. With our “New for 2015” EZ-PUC Mount and EZ-Wiring Backbone systems, the PowerPUC is easier to install than ever. A few common hand tools are all that is required. The most important item you will need is patience. Read and follow the instructions. If at any point you have a question, stop and call us. We also have a growing network of professional installers. Find them G5 Installation instructions. Will It Ever Wear Out? Under normal street use - unlikely. Even if it does, an $8.00 rebuild kit takes about 15 minutes to install. How do the LEDs stay on the wheels? The LED strips have a pre-applied tape from 3M. It is the same product used to apply body molding to cars. IT WILL NOT come off when properly applied. Follow our instructions. They are just as legal / illegal as standard accent lighting. Statutes vary widely. We suggest you check with your local authorities for a definitive answer. But we have found most officials are more interested in how it works than in handing you a ticket. Most important it to ride responsibly and always show respect to the authorities. I Have Wire Spokes. How do attach LEDs? There is always more than one way to skin a cat. First, you CAN attach LEDs to your spokes with very small wire ties, or we have used .025 diameter stainless steel safety wire. You can also use our Hub Wrap kit that wraps LED strips around the hub of your wheel and shines light outward onto your spokes. What’s the difference between Single Color, Color Switching and Dynamic Color Changing Kits? Single Color kits are just that – all the LEDs are one color and do not change. They still have flashing, strobing, fading and other functions. “Color Switching” Kits use multiple single color strips. Combining multiple colors in this fashion gives “depth” to the overall look and creates a jewel-like look to chrome. For instance, combining amber and red looks like fire - even on black wheels. Each color can be controlled independently, both controlled together or effects created between the 2. Dynamic Color Changing Kitsuse special LEDs known as RGB. Each “chip” on an LED strip contains a Red, a Green and a Blue LED. Combining these colors in varying intensities creates multiple colors. So depending on the controller used, all the colors of the rainbow are possible. All Your videos show rapid changes of colors and patterns. Can I stop on just one? With limited time for demonstration videos, we show the most capabilities in the shortest amount of time. But most functions and colors can be held by a simple click of your remote control. What’s the NEW for 2015 PowerPUC-G5 all about? 1) EZ-Backbone Wiring System™ (Patent Pending)- Wiring just got a whole lot easier. A single strip of low profile quick connectors attaches to your wheel with 3M peel-and-stick tape. All wires now connect to this single strip. 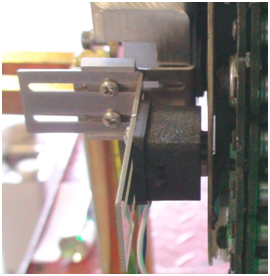 Simply cut your wires to desired length and insert into connectors. No more bulky wiring or soldering necessary. Significantly reduces installation time and results in a neater appearance. Six micro connectors are spaced equally over a 20” strip. Any connector can be used for receiving power from the PUC ring and /or supplying power to the LEDs. Think of it as the multi-outlet power strips that are commonly used in our homes - several appliances can be plugged into one strip. 2) EZ-PUC Mount™ (patent pending) - Takes the guesswork out of mounting and aligning the PUC Ring. A simple polycarbonate plate attaches to your rotor, sprocket or pulley and assures perfect alignment, flatness and concentricity of the PUC Ring. The PUC Ring is now supported 100%. Unique “Split” design of both PUC Ring and EZ-Mount means wheels do not need to be removed from bike for installation. 3) G5 Power Block (patent pending)has been completely redesigned. The contactors have more than 2X the surface area, 3X the directional strength and double the length and throw. Although the need is unlikely,it can be easily disassembled for trouble shooting or completely rebuilt with an $8.00 kit. Lastly, an industry standard quick connect is built-in and makes removal of the Block a snap. Over 1000 are currently in service with virtually zero failures. 4) G5 Power Block Mount (patent pending) is now pre-formed and fully adjustable for easy alignment with the PUC Ring. Made from stainless steel and aircraft grade aluminum, it is more than 3 times as rigid and can be mounted in multiple locations and configurations. Kits can be as subtle or “In-Your-Face” as you like. For 2015 we are introducing several new kits to duplicate effects you could only get previously from our own in-house designer / installers. Since we have kits for virtually any bike and design, the choice then comes down to personal preference. All Kits (Except Basic) come with a standard quantity and size of strips. There are many kits you can choose from. All Kits are for 2 wheels, EXCEPT Bagger Kits. 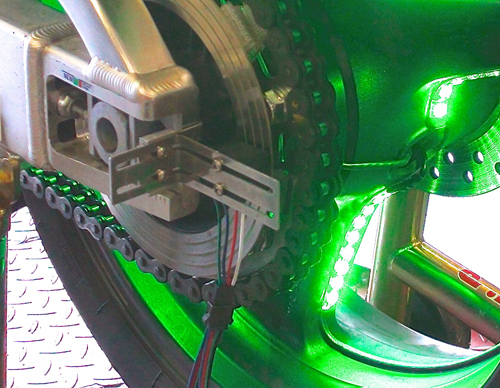 Bagger kits light your front wheel and include additional LEDs for “Under Bag” lighting and color balance. There's something to be said for keeping it simple. Our Single color kits are just that. Pick you color when ordering. Includes a remote that strobes, breaths, and dims for multiple Effects. Includes our new EZ-Wiring Backbone and EZ-PUC Mount systems that dramatically simplify installation. Add optional Body Kit to light your entire bike and save $$. LEDs are matched to your specific kit. (1) Multi-function controller with several strobe, flash, "breath" and brightness functions. Includes 2 key FOBs. **EZ-Mount is available for most bikes. To determine if available for your bike, enter the Make, Model, Year and options into the "Kit Finder". If the resulting Kit Code begins with a letter, it will include the adapters. If it begins with a number, no adapter is included and PUC Ring will need to be installed "Old School". See Instructions. This is our newest - and perhaps coolest kit yet. When groups of different color LED strips are combined with an RGB controller, each color can be controlled individually or in various combinations. Some wild effects are the result. For example: Let’s say there are 6 strips of LEDs on a wheel (standard) - 3 are blue and 3 are white. You can have only the blue LEDs on solid, strobing, breathing, dimming and other functions. The same can be done for just white LED strips. Includes our new EZ-Wiring Backbone System that dramatically simplifies installation. (1) Multi-Channel, Multi-function controller with several strobe, flash, "breath" and brightness functions. Includes 2 key FOBs. **EZ-Mount is available for most bikes. To determine if available for your bike, enter the Make, Model, Year and options into the "Kit Finder". If the resulting Kit Code begins with a letter it will include the adapters. If it begins with a number, no adapter is included and PUC Ring will need to be installed "Old School". See Instructions. This has been the go-to kit for most of our customers. Change colors and effects of all your LEDs with a simple click of a remote controller. Includes our new EZ-Backbone wiring System. Mount your LEDs, cut and strip wires to length and insert into quick connectors. (12) Color Changing Strips of 9 LED x 5” long each. (1) RGB Controller for color changing lights with 16 Function remote. Includes 2 key FOBs. (1) Multi-function remote controller with several strobe, flash, "breath" and brightness functions. Includes 2 key FOBs. Bump it up a notch by using 2 colors of LEDs. This kit lights your front wheel with our PowerPUC-G5, 1 wheel kit, then adds LED strips for under your bags to create additional lighting and color balance. When 2 groups of different color LED strips are combined with an RGB controller, each color can be controlled individually or in various combinations. Some wild effects are the result. For example: Let’s say there are 6 strips of LEDs on a wheel, 3 are one color and 3 are another color. You can have only one color LEDs on solid, strobing, breathing, dimming and other functions. The same can be done for just the second color strips. Next, you can have both colors on simultaneously and get the same strobe, breathing, fading and other functions, or get the same functions between colors. All orders will have an equal amount of each color LED strip. You choose the colors. Change your colors and effects with a push of a remote control button. This kit lights your front wheel with our PowerPUC-G5 1 wheel kit, then adds LED strips for under your bags to create additional lighting and color balance. Kit comes standard with (6) 9 LED X 5” long strips for front wheel and (4) 18 LED x 10” strips for under bags (2 per side). (6) Strips of 9 LED x 5” long each. Note: Check your hubs for available space before ordering this kit. Stage 1 - Single color kits require a minimum of ¾” flat area on each side of hub. If you don’t want LEDs on your spokes, but want the effect only dynamic, rotating lighting can provide and easy installation, then Hub Wraps are right for you. Hub-Wraps are very effective on polished, chromed or brightly colored rims where light can “bounce around” and reflect off various features of your wheel. Hub Wraps use LEDs on each side of your wheel hub that project extremely bright light outward onto your wheels. (1) Single color Multi-function controller with multiple strobe, flash, "breath" and brightness functions. Includes 2 key FOBs. Note: Check your hubs for available space before ordering this kit. 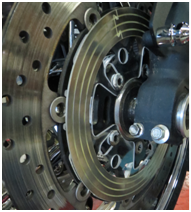 Stage 2–Two (2) color kits require a minimum of 1” flat area on each side of hub. Doubles the number of LED strips of the single color kit and gives you the same effects as our other color switching kits. If you don’t want LEDs on your spokes, want the effect only dynamic, rotating lighting can provide and easy installation, then Hub Wraps are right for you. Hub-Wraps are very effective on polished, chromed or brightly colored powder coated rims where light can “bounce around” and reflect off various features of your wheel. (1) Multi-Zone, Multi-function controller with several strobe, flash, "breath" and brightness functions. **EZ-Mount is available for most bikes. To determine if available for your bike, enter the Make, Model, Year and options into the "Kit Finder". If the resulting Kit Code begins with a letter it will include the adapter. If it begins with a number, no adapter is included and PUC Ring will need to be installed "Old School" See Instructions. Change colors of all your LEDs with a simple click of a remote controller. Hub-Wraps are very effective on polished, chromed or brightly colored powder coated rims. If you don’t want LEDs on your spokes, want the effect only dynamic, rotating lighting can provide and easy installation, then Hub Wraps are right for you. Hub Wraps use LEDs on each side of your wheels - wrapped around the hub that project extremely bright light outward onto your wheels. (4) Color Changing Strips of 36 LEDs x 19.5" long each. (1for each side of both wheels). Note: Each LED strip is ½ wide. Backbone is installed on 1 side of hub and is ¾” wide. Check your hubs for available space. **EZ-Mount is available for most bikes. To determine if available for your bike, enter the Make, Model, Year and options into the "Kit Finder". If the resulting Kit Code begins with a letter it will include the adapter. If it begins with a number, no adapter is included and PUC Ring will need to be installed "Old School". See Instructions. Want to PUC your bike on a budget? Our Basic kit saves $$ by letting you to use LEDs and a controller you may have around from some other project. (Common Positive (+) RGB’s not recommended) Kit includes the core components necessary to get power from your bike to both wheels. You can use your own single color, combination colors or color changing LEDs.